The Lakeland Hockey Association is governed by the policies, rules and regulations of LHA, MAHA and USA Hockey. We expect our players, coaches, parents and other LHA spectators to follow the words and the spirit of the ZERO TOLERANCE POLICY of USA Hockey, which is described below. The LHA Rules & Conduct Committee will investigate and take appropriate action on any Zero Tolerance Policy issue brought to our attention, whether or not a penalty or suspension is imposed for the conduct in question. Your contact information- Your contact information will not be shared, but is necessary for any follow-up questions we may have. Our reputation is our greatest asset. 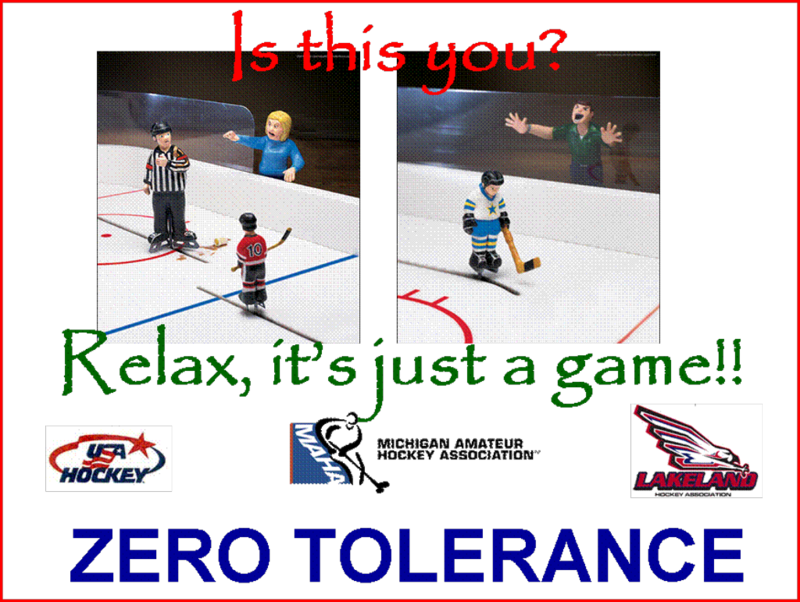 LHA thanks you for your support in complying with the Zero Tolerance Policy and for encouraging the spirit of fair play and sportsmanship for all of our players, coaches and families. Shared Tolerance Appreciation and Respect is MAHA's program that allows parents, players, coaches, and officials to report abusive behavior. We realize that watching little loved ones skate around the rink can occasionally be frustrating. But there should be limits on the manifestations of that frustration. If you take a look at the following questions and notice a bit of yourself in there, or if you answer yes to all of them, we ask that you kindly remove your name from running for hockey parent of the year. Are you more fond of your child's first skate than his or her first steps? Was the child's first stuffed animal neither stuffed nor an animal, but a puck? Do you keep your son or daughter's stats during warmups? Have you ever dreamt of the above scenario? Did you bribe the rink manager to take it down? Have you ever refused to remove your foot from a coach's neck until he threatens legal action? Have you ever threatened someone else at a game with legal action? Have you ever threatened someone else at a game with your kid's Synergy? Do you think of sneaking through the ventilation system and into your son or daughter's opponent's locker room, where you can take sandpaper to a few strategically chosen skates? Did you christen your child in a makeshift Stanley Cup? Was your child's first word the name of your favorite hockey team? Do you wish your child's first word was the name of your favorite hockey team? Have you ever led a "S-I-E-V-E!" chant against a 10-year-old? Do you include in your local youth hockey newsletter a section called "coaches on the hot seat"? Do you speak often in sports cliches?